King Charald is cursed with a half-blood mystic son. Sorne is raised to be a weapon against the mystics. Desperate to win his father’s respect, Sorne steals power to trigger visions. Unaware King Charald plans their downfall, the mystics are consumed by rivalry. Although physically stronger, the males’ gifts are weaker than the females. Imoshen, the only female mystic to be raised by a brotherhood, wants to end the feud. But the males resent her power and, even within her own sisterhood Imoshen’s enemies believe she is addicted to the male gifts. Sorne tries, but cannot win the respect of true-men. When he has a vision of half-bloods in danger he has to ask himself where his loyalty lies. 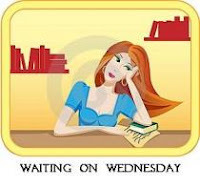 This entry was posted in Waiting On Wednesday and tagged 2012 release, Besieged, EM Castellan, Exile, fantasy, Rowena Cory Daniells, Sanctuary, The Outcast Chronicles, Waiting On Wednesday, WoW, YA Books, Young Adult literature. I want to buy those books based on the covers alone. 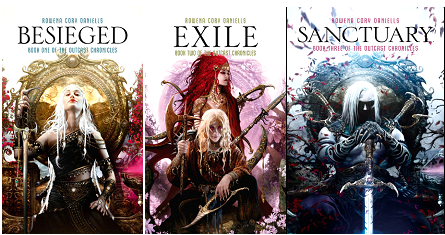 Those covers look really pretty! !